Team Calendars offers great tools for planning and managing your events, whether they're travel, conferences, birthdays, or JIRA issues and sprints. Follow the installation instructions below to start organizing with Team Calendars. 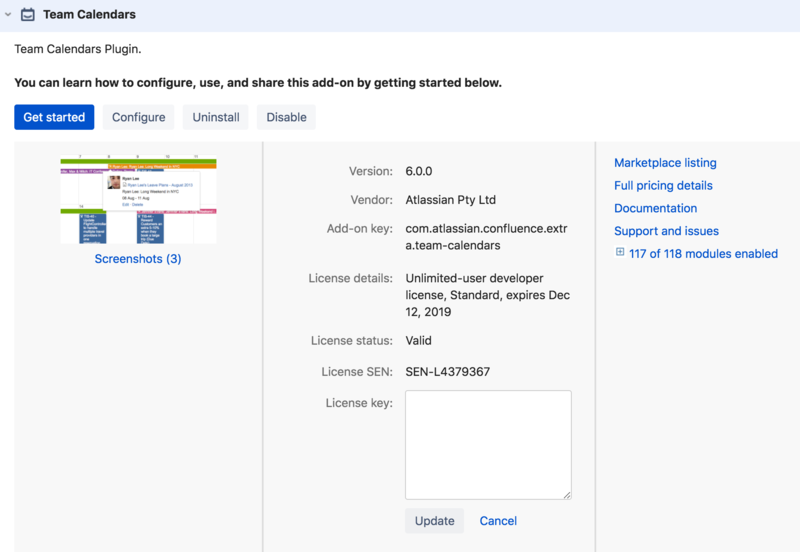 Visit https://my.atlassian.com, generate a license key for Team Calendars and save it. Next, install the plugin and insert your license. Paste your license key into the field provided and click Update, or follow the prompts to get a license if you don't have one. This step is optional and only required if you want to use JIRA integration with Team Calendars. See Linking to Another Application in the Confluence documentation to find out how to connect Confluence to your Jira application using an application link. This only needs to be done once. If, after connecting Confluence to Jira you're still not able to add Jira events to a Team Calendar, make sure the Jira iCalendar Plugin is enabled in your JIRA site. This is bundled with Jira, but may have been disabled by an administrator. When you renew your Team Calendars license you'll be provided a new license key. You'll need to manually apply this key in Confluence. If you have the old Calendar Plugin installed, which was only available for Confluence 3.4.x or earlier, you'll need to go through the following process to migrate to Team Calendars. You'll have a .ics file for each calendar after you complete this step. Choose the .ics file that you saved when backing up your old calendars. Repeat this step to add each calendar back into Confluence. Your old Calendar data will now display in the Confluence Calendars page.